In Australia, as in many other countries, as well as income tax, payroll tax and other taxes levied across all industries, the mining and energy industries pay special imposts or taxes. The natural resource deposits are owned by the people (through their governments). Special taxes on mining are a form of compensation to the people for the private sector extraction of a non-renewable resource. The States are the owners of minerals and oil and gas on their territory, while the Commonwealth government owns offshore oil and gas. The Australian States usually levy ad valorem royalties, charged as a percentage of the price or value of product sold. For offshore oil and gas, since 1988, the Commonwealth Government has applied a petroleum resource rent tax (PRRT) at a rate of 40 per cent of revenue from the sale of petroleum commodities (including crude oil and liquefied natural gas), less cash outlays on labour, capital and materials (an economic rent based tax). Since 2012, the PRRT has been extended with modifications to on-shore petroleum commodities. In 2009, the Henry Tax Review proposed that royalties be replaced with a uniform resource rent tax imposed and administered by the Commonwealth government. The Review argued that “a well-designed rent-based resource tax is less likely to distort investment and production decisions.” In July 2014, the Commonwealth Labor Government introduced a Minerals Resource Rent Tax (MRRT) for iron ore and coal, with some features proposed by the Henry Review but also several differences. The MRRT was enacted with a credit for State royalties rather than replacing them. Following considerable political controversy, and after raising much less revenue than originally forecast, the MRRT was withdrawn in July 2014 by the newly elected Coalition government. Was the failure of the MRRT a case of flawed policy design, flawed implementation or impossible politics? Should Australia be aiming to design a better resource rent tax for the future, or should we instead aim to make the most of existing State royalties? This article contributes to this debate by describing the effects of, and the relative pros and cons of, a royalty versus a resource rent tax as a special tax on mining. It considers their effects on revenue, the efficient allocation of resources to investment and production in the Australian mining industry, distribution of the tax burden and simplicity. Mineral production requires the natural resource deposit plus labour, capital and other inputs. The mining industry has to pay at least market prices to attract limited quantities of labour, capital and other inputs from the rest of the economy. Investments in exploration, in new technology and in management over time increase the known available natural resource deposits and lower the costs of extraction and use of the minerals. Resources required for these investments are globally mobile across different countries, and they are mobile across different Australian industries. At any point in time, there is a range of known natural resource deposits, in terms of the costs of production for each deposit. Those deposits with favourable characteristics, such as small over-burdens, extensive and pure reserves, and access to transport, have relatively low production costs compared with natural deposits with less favoured characteristics. 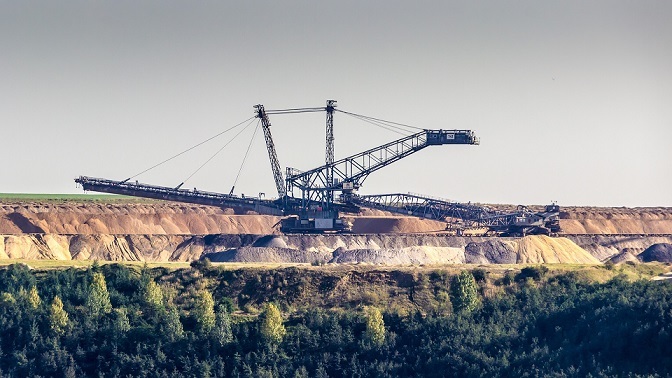 Available cost data for different mining industries indicates cost differences across different mines of from 10 per cent through to 50 per cent. These cost curves also determine the shape and price elasticity of the mineral supply curve. 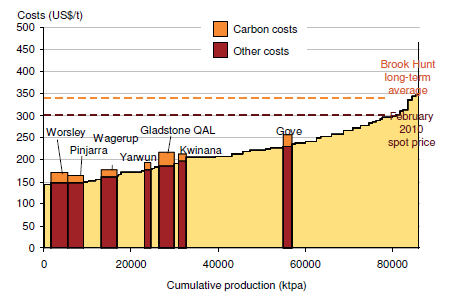 Source: Chart 3.1 from Restructuring the Australian economy to emit less carbon, The Grattan Institute. A royalty places an identical additional cost per unit of mineral product sold for all mines. In particular, mines for resource deposits with more or less favourable characteristics face the same additional special tax. Effectively, the mining product supply curve is shifted upwards by the royalty rate. The more price responsive, or elastic, is the current Australian mining supply curve, the larger the effect of the royalty in reducing production, and the larger the efficiency cost of the royalty. By reducing the return from investment in exploration and technology, a royalty also has a disincentive effect on this investment. Who bears the royalty will depend on the relative elasticities of demand for and supply of the mineral resource. The less price responsive or elastic demand for the Australian mineral relative to that of the current supply curve, the larger is the share of the burden passed forward to buyers as higher prices and the smaller the share borne by shareholders. In an ideal or text-book world, as explained by the Henry Tax Review, a pure rent tax levied on natural resource deposits in fixed supply would: (1) take a share of the economic rent; (2) have no effect on production decisions, and therefore be efficient; and (3) be born fully by the investors, or shareholders, and more so by those with the more favoured deposits. Unfortunately, the resource rent tax in practice is different to the ideal, and it has different effects. First, the asymmetric treatment of recorded resource rent profits and losses brings distortions to investment decisions. Second, the measured resource rent includes both Ricardian rents on the natural resource deposit and quasi-rents earned on investments in exploration and investments to reduce production costs. Over the medium and longer term these investments are both globally mobile and within Australia they are mobile across mining and other industries. By reducing returns on these investments, a resource rent tax on Australian mines will, over time, shift upwards the Australian mining product supply curve, much as does a royalty. An effective comparison of a royalty with a resource rent tax on the mining industry should be made applying tax rates which are approximately revenue neutral. The comparative rates depend primarily on the higher cost mines with less favoured natural deposits relative to the cost advantage of mines with the most favoured natural resource characteristics. 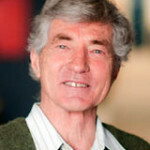 For example, for a 7 per cent royalty rate, to raise comparable government revenue, the resource rent tax rate would be about 25 per cent if the more favoured mine had a 50 per cent cost advantage; but, the rate would need to be about 50 per cent if the cost advantage was only 20 per cent (because of the smaller resource rent tax base). Given wide swings over time in commodity prices, a royalty generates a more stable stream of special taxation revenue than the resource rent tax. On the other hand, mining industry revenues and profits are more stable under a resource rent tax regime. State Government royalties have featured significantly in the deliberations of the Commonwealth Grants Commission concerning the interstate division of federal GST revenue in the horizontal fiscal equalisation process in the Australian federation. Given this, and the direct effects of volatile revenues on State budgeting, the greater revenue stability of a royalty has an advantage. What about the relative efficiency effects of royalties and resource rent taxes? This involves a trade-off between the larger distortion of the royalty to production decisions on mines to develop and the extent of mining a particular natural resource; and the potentially larger distortion effect of the resource rent tax on the level of investment of mobile inputs in exploration and the development of technology, management and work practices to lower production costs. Because the resource rent tax base is much smaller than the royalty base, as noted in the table above, in order to collect about the same revenue the resource rent tax rate has to be severalfold times the royalty rate. Both the royalty and the resource rent tax reduce the after-tax return from mobile investments allocated to the Australian mining industry, but as it must be levied at a higher rate, the resource rent tax imposes a larger disincentive to investment in exploration and cost reduction technology. Ultimately, the relative efficiency cost of the two options is an empirical question, and currently only limited information on key parameters is available. Further, the trade-off will vary across products and over time. Both options will collect similar revenues from non-residents, taken as an aggregate of buyers and investors. Of secondary importance, the resource rent tax will collect a larger share of the aggregate revenue from investors, and more from investors in the mines with more favourable natural resource deposits. Simplicity favours the royalty system, relative to a resource rent tax, especially as the fiscal equalisation process of the Commonwealth Grants Commission must be sorted out for the States in any change of policy for mining special taxes. So is a royalty or resource rent tax better? There is not an unambiguous case for superiority of a resource rent tax versus a royalty in Australia. Detailed information about the relative costs of different mines, the importance of investments in exploration and in cost reductions over time, and the mobility of these investments across countries and other industries is required to quantify the trade-offs. It cannot be assumed that the ideal efficiency of a resource rent tax will be translated in practice. Simplicity, together with similar effects in collecting revenue from non-residents, favours staying with the status quo until more specific and believable data on key parameters becomes available. This article is based on Freebairn J, 2015. Reconsidering royalty and resource rent taxes for Australian mining, Australian Journal of Agricultural and Resource Economics. 59(4) 586-601. DOI: 10.1111/1467-8489.12113. Thanks John for the article. The first comment that I have is that you have suggested that a tax with stable revenue from year to year is a positive attribute, and hence an advantage of a royalty based system. In other circumstances we are told that anti-cyclical taxes are good (i.e. high taxes in boom years, low taxes in recessions act as automatic stabilisers). Is there something special about mining taxes in this regard, or are you against automatic stabilisers in general? The second comment is that there appears to be more scope for simple royalty rules to act in a way that captures more of the pricing rent. You point out that royalties are often paid as a percentage of sales price, meaning that they already increase when world prices increase (and capture some of this windfall gain). Could you not set up something that responded more to the world price. Say rather than having 2% of the total price, have 10% of (price – 80 per cent of expected price). This wouldn’t get at rents from different quality mines, but it would get at rents from price fluctuations. Surely given the complexity of taxation and its inevitable rorting by multinational oil companies, australia would be better off with a norwegian state ownership model. As it stands, a very small percentage of extraction and sale value will ever be delivered to australian tax payers. I dont fully grasp the endless complexities which seem to be in place for the purpose of tax evasion, but would like your opinion and rationale on whether we are just allowing big oil to just loot our house.